First-time moms strive to carry babies to term and experience easy labor. Few are prepared for the immediate challenges after delivery, the "fourth trimester." 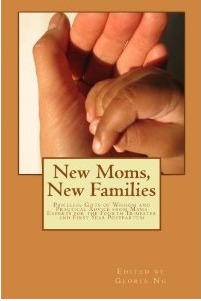 Thus, this unique and holistic collection of alternative tips and practical advice for Moms by Moms was born. Deepen your breath with essential oils and clean air. Warm your tummy with nourishing foods. Feel your center and strengthen your core with intuition. Share and rediscover with your baby the joy of nature and language. Learn to ask questions, settle anxieties, and employ strategies when you suspect developmental delays. Equip yourself with a postpartum depression-busting wellness plan as well as a process to become sensational in the face of being a single mom. Plan ahead with finances and luck cycles. Most importantly, awaken refreshed from great “mountain” feng shui. Let these amazing mama entrepreneurs and professionals from diverse fields of expertise hold your hand, save you time, change your life and give you more sleep! For the first time, new mothers can expect to find a book that is entirely devoted to smoothing out the rapid transition after delivery when creating a new family. This book, unlike many others, is focused on helping the new mom navigate all areas of care that a new arrival necessitates.